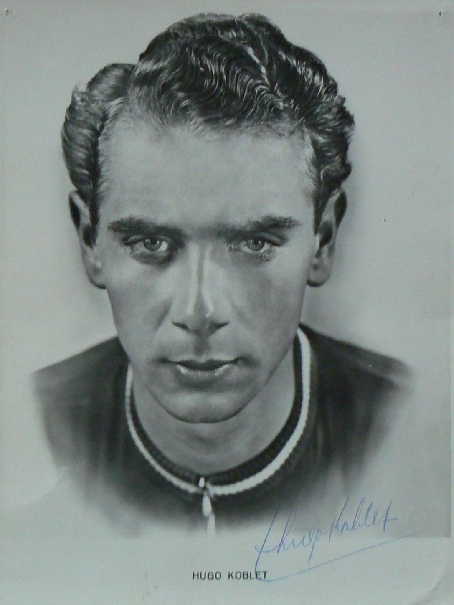 The racing cyclist Hugo Koblet belongs to the most successful Swiss cyclist at all who enjoyed an enormous popularity in the lifetime. The Swiss cyclist fans were divided into two parties - the fans of the elegant Koblet and the fans of the plodder Ferdy Kübler. Koblet began his career on the lane and from 1947 to 1954 he won Swiss Championship in the one trace race steadily. Internationally he achieved the third place in 1947 and in 1951 and 1954 the second place in each case. He became well-known around the workd in 1950, that year he had his breakthrough in the road races. First he won the road race Swiss Championship and afterwards he became the first non Italian who was able to win the Giro d'Italia. He crowned this season with the win of the Tour de Suisse. These successes catapulted Hugo Koblet to new heights and his followings grew rapidly. Because of his seemingly effortless rides even in very steep passages and because of his good looks - he often combed his hair on the brink to the finish line in order to be a looker on the pictures - the singer Jacques Grello gave him the surname "Pédaleur de charme" - a nickname he bore with proud. In 1951 he was able to confirm his success from 1950 and he beat Fausto Coppi at the inoffical World Championship of individual time trial at the Grand Prix des Nations. He definitely became a cyclist legend when he won the Tour de France. But the success also had his dark sides and the persons in charge had high expectations. Only under this aspect it is allegeable that the chief of the Tour de Suisse, Carl Senn, ordered a doctor with the instruction to "make him fit at any costs" when there was the danger that Hugo Koblet had go give up the Tour de Suisse because of a pyelitis. This doctor applied obviously without Hugo Koblet's knowledge amphetamines which probably caused a permanent damaged heart and a reduced volume of the lungs. Still Hugo Koblet was able achive some succès d'estime but he was no longer able to go on as an easygoing attacker he was in former years. Despite he was not in the best of health, which especially became noticeable in the altitude when he was no longer able to breath properly, he won the Tour de Suisse in 1953 and 1955 and became second at the Giro d'Italia in 1953 and 1954. Furthermore he also won the Championship of Zurich in 1952 and 1954 as well as the Tour e Romandie in 1953. His last big success he managed in 1955 with the victory at the Swiss road race championship, afterwards the proficiency level broke in dramatically. He still won several races till 1958 but these rades were more or less trivial rases. Finally he retired from the cycling. To the live of the elegant Hugo Koblet also belonged the glamour when he got engaged with the well-known actress Waltraut Hass. When they separated he lived together with the model Sonja Buehl till to his death. After his career as a cyclist he first worked for an Alfa Romeo agency in Caracas and after his return to Switzerland he run two filling stations. But this civil life could not at bit replace his former life in the limelight. He was not able to modulate his lifestyle to the new circumstances and he spent a lot of money for himself, his friends and his family. At the end he had a lot of outstanding debts. Even former well-known cyclist profis used Koblet's filling stations regularly but "forgot" to pay the purchased petrol. Numerous affaires also led to the breakup with his wife. Switzerland was shocked in 1964 when the news spread like wildfire that Hugo Koblet collided a pear with his Alfa Romeo. The shock became much bigger when the newspaper had to announce some days later that Hugo Koblet died at the hospital at the age of 39. Their arose soon rumors that it was a suicide. But it is also thinkable that he avoided an animal on the street. An employee of Koblet stated that Hugo Koblet already had an accident with this car several months ago and that the car was damaged. After a first repair he was told to replace the damaged trapaze as soon as possible. Koblet never replaced this part which could have let to a wheel collapse. His wife Sonja visited her husband at the hospital and was able to speak with him. According to her statement it was a suicide attempt which succeeded in the end. That the name and man Hugo Koblet still is fixed in the mind of the Swiss people has been demonstrated with the filming of Hugo Koblet's life under the title "Hugo Koblet - Pédaleur de charme". The movie was released in 2010. No one has impressed the Swiss cycling like Hugo Koblet and his permanent rival Ferdy Kübler (who won himself the Tour-de-France in 1950 and the road race world championship in 1951), who caused a never seen euphoria in Switzerland for cycling. Till today the Swiss cycling bred many other great cyclists till then.